Predictably, many on social media are passionately sharing their views. Some with harsh and hateful language. Sadly some who profess allegiance to Christ have dimmed and diminished their light with vitriolic speech. 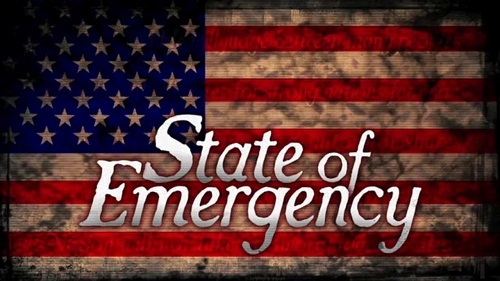 I agree there is a national emergency, but it is even more serious than our porous southern border and the problem of illegal immigration. So, before our readers get riled up and are ready to comment pro or con about this issue, this post is not political. I’m not espousing a position on the President or his proclamation. The state of emergency I’m speaking of is a spiritual, moral and ethical crisis. It is a crisis of the soul. There is a spiritual crisis when tolerance is more valued than Truth. There is a spiritual crisis when the opinions of celebrities, sports stars, and political leaders are preferred over the Word of God. There is a spiritual crisis when relativism is revered more than righteousness. There is a spiritual crisis when sensual gratification, choice, and convenience are cherished more than the life of an unborn child. There is a spiritual crisis when politicians applaud the passage of a bill that allows for late-term abortions up to the time of birth instead of weeping over the barbaric and inhumane disregard for life. There is a spiritual crisis when Christians believe that politicians are the answer to our nation’s ills instead of Jesus Christ and His revealed Word. There is a spiritual crisis when religious leaders are more concerned with their positions, popularity, and pocketbooks than in proclaiming the Gospel of Christ. There is a spiritual crisis when sexual perversion is celebrated and the sanctity of marriage is disregard, debased and denounced. There is a spiritual crisis when we are more concerned about our personal comfort than the content of our character. There is a spiritual crisis when material prosperity is more important than spiritual growth. There is a spiritual crisis when we ignore injustice, prejudice and racial discrimination instead of standing for what is right. There is a spiritual crisis when we believe we are self-sufficient and can thrive alone without the support of a Church-Family. There is a spiritual crisis when we abdicate our personal responsibility instead of being accountable and answerable for our actions and attitudes. While I’m an optimist by nature, these humanistic trends do not bode well for our nation’s future. However, “it is far better to light a candle than to curse the darkness.” While I may not have much direct influence of what happens in the White House, the Court House or the State House, I can be an example of goodness and godliness in my house. In the Lord’s house where I worship. With my family and friends. And in the community where I live. Thank you for these wise words. I have FB friends who claim to honor Christ and then turn around and use the term “libtards” to denigrate those who disagree with them. I privately admonished one of them, and they have stopped using this term, but their unloving attacks continue. It is trite, I know, but the song said it well: they will know that we are Christians by our LOVE. Calling people derogatory names never won anyone to Christ. We all need to wake up and shine our lights. Amen.I see so many Christians who get so wrought up over politics. My answer isGod will take care of it. Might not always be to our liking but he will. Absolutely! Couldn’t agree with you more. Great post, Ken W. Think I’ll run it next week in our bulletin. I absolutely believe we have an emergency on our southern border. But the greater emergency is indeed as you describe it. Thanks, Ken. You are certainly welcome to reprint this post. Look forward to being with you all in April. Loved the old Coolidge quote. Sounds like he was talking to our generation. If the Democratic Party commits murder by defending the constitutional rights to privacy of American families to abortions free of governmental intervention in their private lives, does the Republican Party commit adultery by defending the constitutional rights of American families to divorce and remarriage for any cause free of governmental intervention in their private lives? If so, do those of you who vote Republican commit adultery like you believe those who vote Democratic commit murder? Excellent and timely thoughts Ken W!